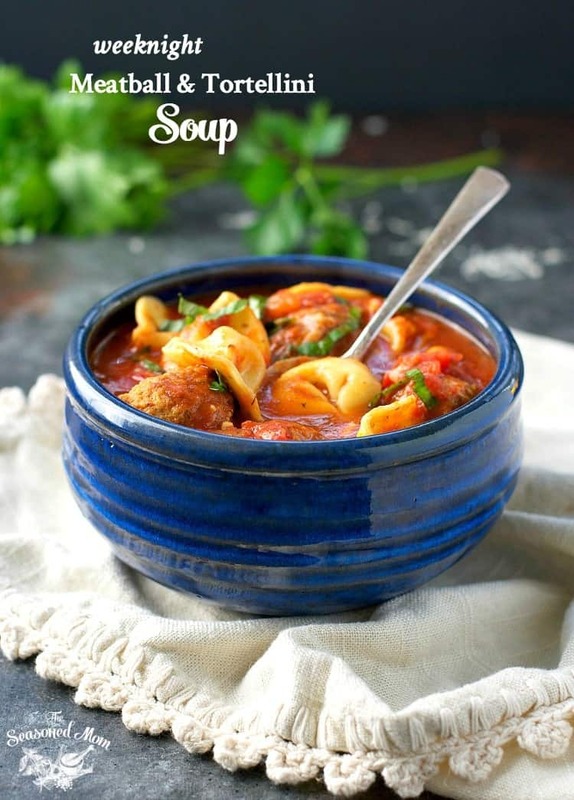 A super easy and comforting meatball and tortellini soup that comes together in only 30 minutes! 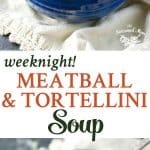 With just 2 minutes of prep and one pot, this Weeknight Meatball and Tortellini Soup is an easy dinner that comes together in only 30 minutes! And p.s. — your family will love it! This time of year just call for comforts from the cozy fires to the toasty sweaters, the excuses to drink hot cocoa, and of course…the soup. 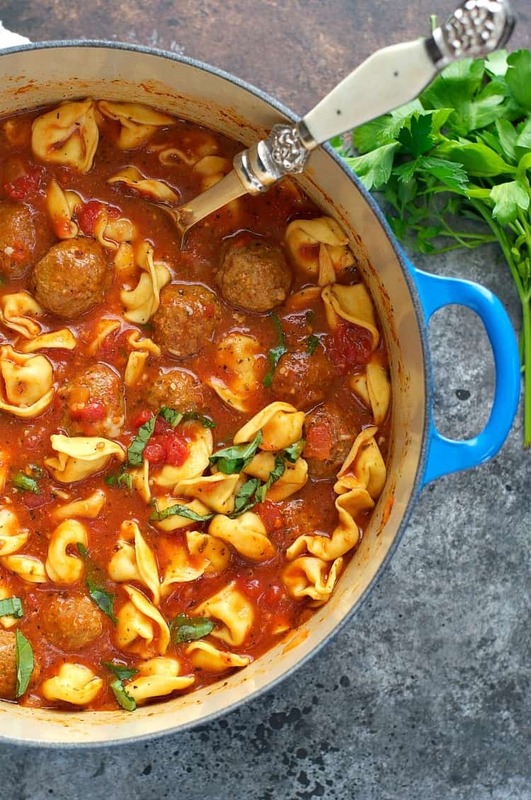 I seriously love the smell of a big pot of goodness simmering on my stove, and this Meatball and Tortellini Soup just might be one of my greatest (soup) accomplishments yet! 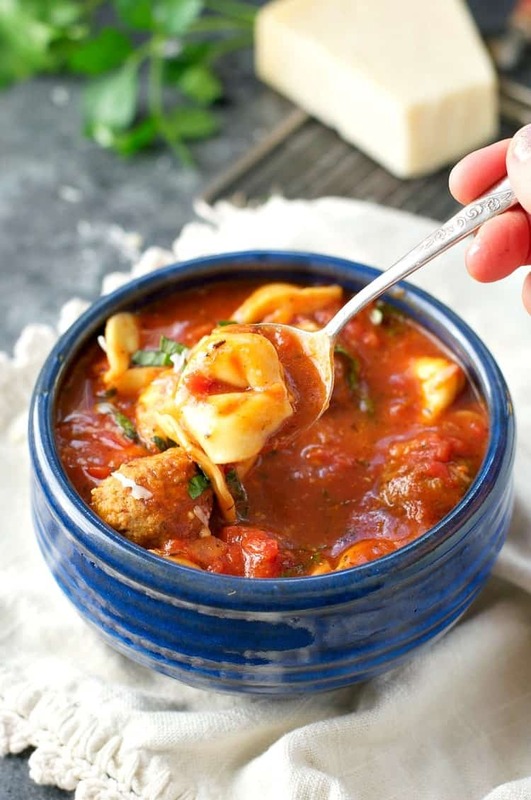 By employing some of my favorite kitchen shortcuts, I managed to get this rich, flavorful, hearty, and delicious tortellini soup on the table (from start to finish) in 30 minutes. And did I mention that there’s no prep work necessary? I love the ease of frozen diced onions (no chopping, no dishes, and no tears! ); frozen meatballs; and a bottle of fresh minced garlic (find it in the produce section) for a simple dinner that requires almost zero work on my part. I’m all about minimal effort.? Plus, who wants to wash an extra cutting board or sharpen a knife? Not me. While I’m calling this a meatball and tortellini soup, I’d actually say that it’s more like a meatball and tortellini stew. It’s thick, hearty, and full of pasta and meatballs (without much broth). The sauce tastes rich and homemade, as though it’s been simmering on the stove all day in an Italian grandmother’s kitchen. When you serve the bowls and grate some fresh Parmesan over the top, nobody needs to know that that this dinner was an afterthought at the end of an otherwise overwhelming, frantic, and unplanned day. Instead, it’s the perfect ending to another chilly winter day…that gets us one step closer to spring! Cooking Just for Two? You can prepare a smaller batch of the soup and freeze any leftovers for a later meal. For a half batch of the soup, you will need to cut all of the ingredients in half. For instance, use a smaller (15 ounce) can of diced tomatoes, an 8 ounce can of tomato sauce, a 2-cup can of broth, fewer meatballs, and a small package of tortellini (rather than the 20-ounce “Family Size” that I purchased). Making This Soup In Advance? Follow all the steps but don’t add the tortellini until you are ready to eat the soup. Pasta never keeps well in soup for a long period of time as it swells and becomes sticky. To Freeze – Follow the same advice as above. Don’t freeze this with the pasta, instead add it once with soup has thawed and you’re ready to re-heat. In a large pot, heat olive oil over medium-high heat. Add the onion and garlic, cooking and stirring until onion is tender (about 2-3 minutes). Stir in the diced tomatoes, tomato sauce, Italian seasoning, beef broth, and meatballs. Bring to a simmer and cook, uncovered, for 20 minutes. 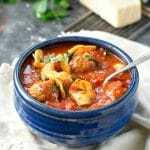 Add tortellini to the soup and cook for an additional 7 minutes, or until pasta is tender. Stir in Parmesan cheese. Season with salt and pepper, to taste. Serve soup immediately, and garnish with additional cheese and fresh basil. Cooking Just for Two? You can prepare a smaller batch of the soup and freeze any leftovers for a later meal. For a half batch of the soup, you will need to cut all of the ingredients in half. For instance, use a smaller (15 ounce) can of diced tomatoes, an 8 ounce can of tomato sauce, a 2-cup can of broth, fewer meatballs, and a small package of tortellini (rather than the 20-ounce "Family Size" that I purchased). Making This Soup In Advance? Follow all the steps but don't add the tortellini until you are ready to eat the soup. 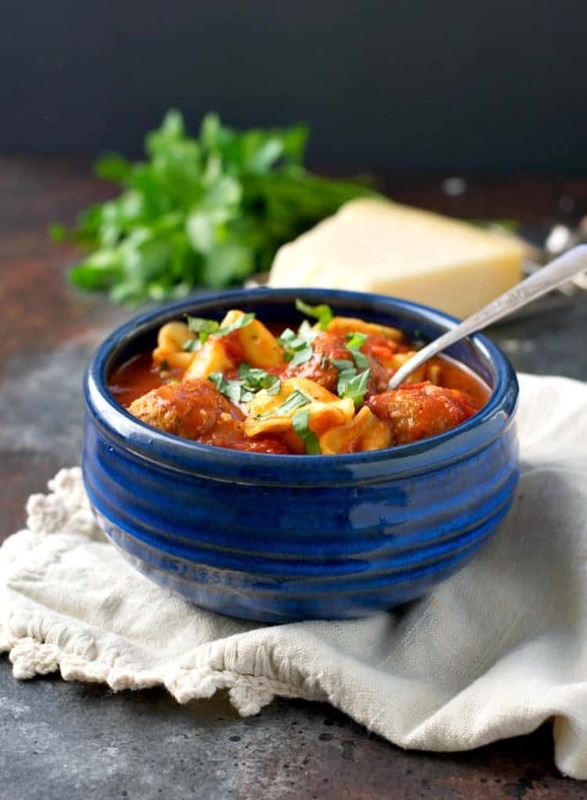 Pasta never keeps well in soup for a long period of time as it swells and becomes sticky. To Freeze - Follow the same advice as above. Don't freeze this with the pasta, instead add it once with soup has thawed and you're ready to re-heat. Just 2 minutes of prep?! Sign me up! I know what you mean about planning dinners in advance. Sometimes, I have lots of ideas, other times, zero. It’s nice to turn to tried and true favorites like this! Love the meatball and tortellini combo, Blair! I know, right?! It seriously doesn’t get any easier! Your photos are mouth-watering, Blair! This is such a great meal for those busy nights and would be fun for the big game this weekend too. January and February are the worst months. And yes, there’s a hot cocoa and cozy sweaters BUT honestly I can’t wait for some sun to shine and temperatures to rise above 10C 🙂 But as long as we have comforting soups, to warm us up, like this deliciousness, then we are good, right 😉 Lovely soup Blair. Really mouth-watering. Sharing off course 😉 Have a lovely weekend dear! Yes, you do! It’s so delicious! Have a great week, Kristy!